莱茵论坛 第152期 活动-(英语)讲座|杜塞 –中德电动汽车市场的发展现状 机遇与挑战 | Rhine Academic Forum e.V. 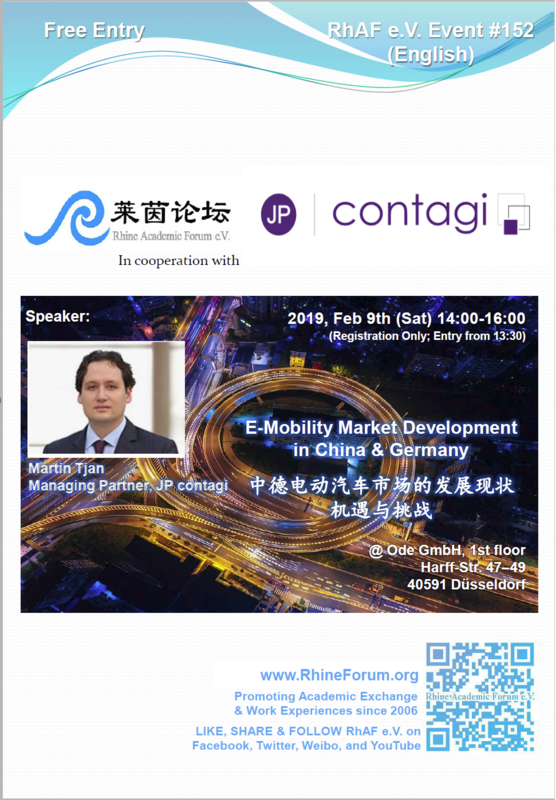 – Event no.152: E-Mobility Market Development in China & Germany – Rhine Academic Forum e.V. Managing Partner of JP contagi. He leads the China Desk for the company and works for Western and Chinese clients with focus on the automotive, machinery & plant engineering and automation industry. Martin has a Master’s degree in East Asian Studies from Duisburg-Essen University and Shanghai East China Normal University. He has spent more than eight years of his professional career in Shanghai and gained a profound understanding of Chinese business culture and the insights of different industry thriving. For more details, please read following text (pdf format, English and Chinese).